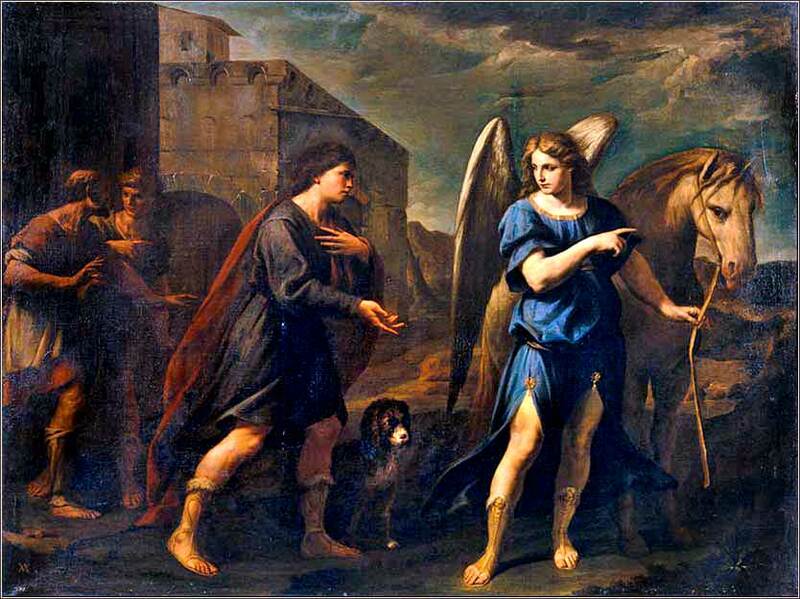 Tobias Meets the Archangel Raphael by Andrea Vaccaro, ca. 1640. 435 people in our community are currently praying with you. 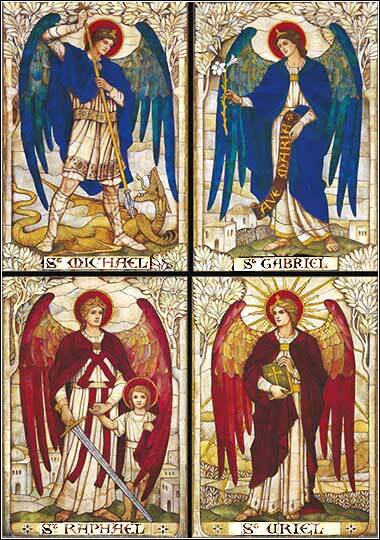 The Four Archangels: Michael, Gabriel, Uriel, and Raphael (clockwise from top left). Raphael is depicted guarding a young boy, probably symbolizing Tobias. They travelled on to Media, and as they were approaching Rages, Raphael said to Tobias, “Brother, tonight we will lodge with Raguel, your cousin, who has a daughter named Sarah. She must be given to you as a bride if you ask, and her inheritance also, for you are her only cousin. And I must tell you: She is both beautiful and good-natured. The angel replied, “Do you remember the instructions of your father, that you should marry a wife of your own tribe? Listen, she shall be your wife. Pay no heed to this demon, for you will marry her this very night. Tobias was so stirred by these words that he began to love her. And in his heart he had married her already. e see, in this charming passage, two of the themes that run throughout the book of Tobit. First, the importance to the Jews of the diaspora that they marry within their race. This is even more narrowly limited in Tobit to one's tribe or even close family. Single men in some degree of family relationship to a maiden — we do not know the details, but it seems like Tobias and Sarah are second or third cousins — could claim her for marriage as a right of law. Sarah must marry Tobias if he makes a legal claim to her father. (From the story of Isaac and Rebekah, it would seem Hebrew maidens normally had a right to refuse a marriage. Genesis 24:57-58.) For his part, Tobias has been commanded by Tobit to marry someone in the tribe of Naphtali, and preferably someone in his clan (a subdivision of the tribe). We might guess that this is the only way a Jew, deprived of records and lost in a foreign country, might be assured that a husband or wife was also full-fledged Jew. Some humor is undoubtedly intended in Tobias’ objections to marrying Sarah; after Tobit's constant obsession with burial, now Tobias' concern is that if he dies, it will kill his parents, but since his death caused their death, he won't be alive to bury them. Tobit is, actually, a comedy in the classical sense; by Grecian standards, comedies could treat serious subjects, but would have a happy ending, and the strain of comic lightness in Tobit signals that things will end well. Still, it must have been a great concern to the Jews, in their struggle to retain their integrity as God's chosen people, that their dead be treated with dignity, rather than thrown on the ground to rot like animals. We now begin to see, also, some allegorical meaning in Tobit. Tobias, guided by the Archangel Raphael, is a proxy for Yahweh, and Sarah represents the Jewish people. Although they are punished for their idolatry, symbolized the dominion a demon has over Sarah, the Hebrews have not been abandoned by God. The few faithful continue to discharge their obligations to Yahweh under the law of Moses. God, as the bridegroom, will yet honor the covenant He made with Moses and Abraham for these faithful. The locations are not accidental. It was Assyria to which the Hebrews of the Northern Kingdom were deported; but it is Media, and in fact the very city where Raguel and Sarah live, from which Cyrus the Great will order that Hebrews be allowed to return to Jerusalem and rebuild the Temple. Proverbs 13:10: Pride breeds nothing but strife, but wisdom is found in those who take advice.